The most simple way of lifting water from a well is a rope and a bucket or other container like a tyre. 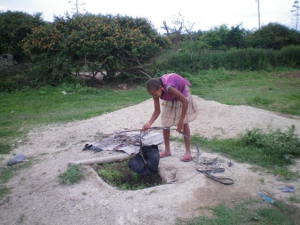 – To use a bucket the well has to be open so dirt, or even children can fall into the well. – A bucket and rope can contaminate the water in the well, because of dirty hands, mud on the bucket etc.